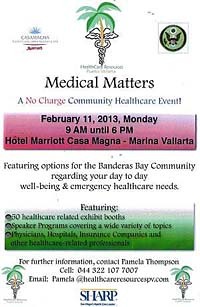 Are you a Banderas Bay area resident or visitor interested in your health and well being? If so, you won't want to miss the Medical Matters Conference on Monday, February 11 from 9:00 am to 6:00 pm at the Hotel Marriott CasaMagna Marina Vallarta. The day will feature a vast array of healthcare-related providers including international insurance representatives, local private hospitals, clinics, physicians, spas, diagnostic centers, labs – to name a few. In addition, the event sponsors – HealthCare Resources, the US Consular Agency, the CasaMagna Marriott Puerto Vallarta Resort & Spa, and Sharp Hospitals San Diego, – are proud to welcome some very distinguished medical practitioners as featured speakers at this year's Puerto Vallarta Medical Matters Conference. Note! There is no charge for these talks and there is no pre-registration. Just show up at the Marriott where they will again be offering discounted prices for lunch at all their restaurants. • 10:00 am – Dr. Mark Koenig - Gays In Paradise - "Skin Issues and Party Time" - General issues for the aging adult male on skin diseases and cancer and the impact of extensive recreational partying. • 11:00 am – Dr. Armando Joya - "Colon Conversation" - Anything and Everything to do with your colon: function, disease, colon cancer, current trends in treatment of colon issues. • 12:00 Noon – Dr. Alberto Marron - "Orthopedics and Stem Cells"
• 1:00 pm – Nathalie Batilliot de Celorio – Registered Dietician - "Pre-Diabetic/Diabetic Diet – Creating a Healthy Eating Plan"
• 10:00 am – Dra. Laura Garcia – OB/GYN - "Pap Smears, Pelvic Exams and Papilloma – Women's Exams"
• 11:00 am – Dra. Adi Dominguez – Psychiatrist - "Brain Preservation – The Facts About Alzheimers"
• 12:00 Noon – Roberto Castellaños – Mariner's Insurance - "Health Insurance Available in Mexico"
• 1:00 pm – Dr. Miguel Saldaña - "Holy Cow! What Happened to Me?" - Aging and some options for improving a few things! • 2:00 – Dr. Octavio Lomeli – Dentist - "Trends in Modern Dentistry"
• 3:00 – Dr. Carlos Garcia – Urologist - "Current Trends in Prostate Cancer"
Hotel Marriott CasaMagna is located in Marina Vallarta at Paseo La Marina Norte 435. For more information, contact Pamela Thompson, or by cellular at (322) 107-7007.